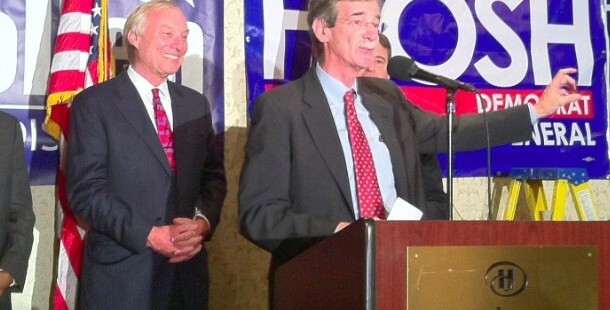 At victory celebration election night Nov. 4, Attorney General-elect Brian Frosh and Comptroller Peter Franchot on left. Incoming Attorney General Brian Frosh promised to be “a strong advocate of transparency and openness” in a speech celebrating the 40th anniversary of Common Cause in Maryland, citizen group committed to open government issues. Reporters, activists and average citizens have widespread complaints about how Maryland’s Public Information Act is interpreted in different state agencies. The assistant attorneys general that act as legal counsel to most units of state government are routinely involved in responding to requests for documents and information. Frosh, a Montgomery County state senator known as a champion of environmental causes, cited the example of environmental groups who have trouble getting copies of permits from the departments of Natural Resources and the Environment. “That’s permits to pollute the air and water” to some extent, Frosh said. Those permit applications are often submitted electronically, but rather than release the records in electronic form, Frosh said the agencies will print them out on paper and then charge the groups for making copies of the applications, which sometimes run to hundreds of pages. “It’s crazy,” Frosh said. The state should not be throwing up obstacles to getting information. Frosh said while those in charge of agencies don’t have to follow the advice of the assistant attorneys general, that advice ought to favor of releasing information to the public. In other speeches at the 40th anniversary “bash” in Columbia, former Montgomery County Council member Phil Andrews, a former executive director of Common Cause, said he believes that Gov.-elect Larry Hogan “has an obligation to replenish” the public financing that he used to campaign on, and perhaps extend it to other state offices. Common Cause has long advocated limits on campaign contributions and public financing of political campaigns. Andrews recently won passage of legislation for public financing of local campaigns in Montgomery County. The public financing was funded by voluntary contributions on state income tax forms, but the legislature eliminated those check offs several years ago.